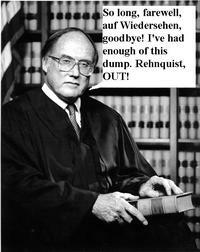 Adding to the tension [over a possible Alberto Gonzales nomination] is word from court sources that ailing Chief Justice William Rehnquist also will announce his retirement before the week is over. That would enable Bush to play this game: Name one justice no less conservative than Rehnquist, and name Gonzales, whose past record suggests he would replicate retiring Justice Sandra Day O'Connor on abortion and possibly other social issues. Thus, the present ideological orientation of the court would be unchanged, which would suit the left just fine. Very interesting! This would explain WHR's apparent failure to hire his clerks for October Term 2006, which he would typically do in June 2005. If a Rehnquist retirement announcement is forthcoming, expect it to arrive on Friday morning, just as Justice O'Connor's did. Would Luttig have voted for medical marijuana? Judges M. Luttig and J. Harvie Wilkinson of the Fourth Circuit are often mentioned as possible replacements for Justice O'Connor. Federalism, and what it means in the wake of the Raich decision is an important distinction between Wilkinson and Luttig. It seems like Luttig's reasoning in the dissent below (Gibbs v. Babbitt) would suggest that he would have voted to invalidate the marijuana regulation in question in Gonzales v. Raich. In Gibbs, Judge Luttig dissented from a decision holding that a Fish and Wildlife Service regulation limiting the killing of endangered wolves on private land was within the commerce power. Judge Luttig argued that the killing of a small number of wolves did not have a "substantial effect" on interstate commerce required by Lopez and Morrison. The case has received media attention because of the criticism of Judge Luttig's views in the majority opinion written by Judge Wilkinson. Judge Wilkinson argued that Judge Luttig "would rework the relationship between the judiciary and its coordinate branches" by allowing courts to invalidate laws based on "a judge's view of the wisdom of enacted policies." Judge Luttig's view of the substantial effects test cannot be reconciled with his mentor, Scalia's opinion in Gonzales v. Raich. For starters, the grey wolf taking regulation in question in Gibbs IS part of a larger regulation, the Endangered Species Act. This is the specific reason why the marijuana regulation was upheld by Scalia, because the Congress is allowed to make regulations that reach purley intrastate activities if regulation of those intrastate activities is part of a larger scheme of interstate commerce regulations. Under Scalia's reasoning in Raich, the grey wolf taking regulation would have been valid. So is Luttig in favor of medical marijuana? The Fourth Circuit has not ruled directly on the medical marijuana issue (none of the states in the Fourth Circuit have passed medical marijuana laws), see Raich at fn1. See e.g. United States v. Dash (10th Circuit 1997)(maufacturing controlled substance can be reached by the commerce clause based legislation). Proyect v. United States (2nd Cir. 1996) (manufacturing marijuana can be reached by commerce clause based legislation). However, in United States v. Leshuk, 65 F.3d 1105, 1111-12 (4th Cir. 1995), Judges Russell, Hall, and Widener upheld the CSA's application to the growing of thirty three marijuana plants. Judge Luttig did not participate in the decision. The Leshuk decision itself simply says that because Congress made explicit findings that the manufacture of marijuana substantially affects commerce (and Congress failed to make the findings in the Gun Free Schools Zones Act), the CSA is valid. However, there were findings made by Congress in the VAWA, and they are explicitly discussed in Luttig's dissent in Brzonkala. Luttig specifically criticizes finding an act of Congress contitutional against a commerce clause challenge just by making conclusory "findings." Luttig states: "Ignoring entirely the overarching change in Commerce Clause analysis wrought by Lopez, the majority merely recites several statements from House and Senate committees on the general problem of violence against women and the effect of that violence on the national economy, together with a sentence from a House Report stating that violence against women substantially affects interstate commerce (incidentally, never mentioning that the Senate, as opposed to the House, did not conclude that such violence substantially affects interstate commerce) and then simply states, without more, that the Act is constitutional." "The majority's wholesale deference to a committee finding would at least be understandable if that committee had made extensive findings deserving of deference. However, the majority ultimately sustains the constitutionality of the Act literally on the basis of a single sentence appearing in that committee report, which sentence is, itself, entirely conclusory." Luttig is a true federalist and seems willing to examine the sum and subtance of Congressional findings vis-a-vis the substantial affect any given activity may have on interstate commerce. He probably would have bucked his mentor Scalia and voted with Thomas in Gonzales v. Raich. And we're sure the "sources" aren't Aaron Sorkin and a few of his favorite mushrooms?